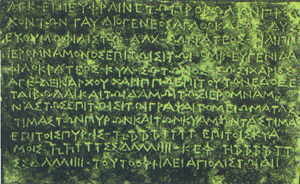 The greatest part of the collection of 39 bronze tablets (written in Greek characters and dating back to the IV and to the III century b.C.) can be found, nowadays, at the National Museum of Reggio Calabria; they come from what has been called "the Archive of the Sanctuary of Olympian Zeus", located in the Pirettina district. These bronze tablets (which are of various size) weren't recovered during official excavations; instead they were unearthed in 1958 by some peasants who, at first, hid them (probably with other bronze tablets and with many other treasures which, unfortunately, lies who knows where) waiting for a chance to sell them. But afterwards they were eventfully recovered by the proper authorities and then, after they were studied, exhibited in the museum. At first, when the bronze tablets were studied, there was the hope that having been discovered in the native city of the first western lawgiver, Zaleukos, they could have been his codex of laws; but they weren't. After the first instants of disappointment (even if it's not correct to describe it that way, since the scholars were in front of some archaeological finds which are unique not only to Magna Graecia, but also to the whole Greek world) the experts were able to get a lot of information from them; information which contributed to better describe the economic and politic history of Locri Epizephyrii. Moreover, these bronze tablets gave precise information about the institutions, the calendar and, also, about the onomastics of the ancient Locri. Generally, these bronze tablets are the registration of the money which the treasurers of the temple of Zeus lent to the city; loans which, according to the documentations of the bronze tablets, were seldom repaid.